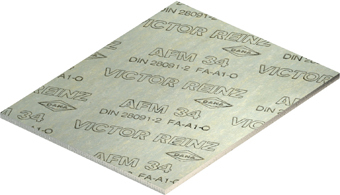 AFM 34 is Victor Reinz®’ most successful gasket material of all time. This aramide fiber-based classic is completely harmless from a physiological point of view and has all the important approvals (TA Luft and FDA-compliant, to name a few). Universally useable, this gasket material is the perfect sealing solution for a huge number of media and a wide range of temperatures and operating pressures. Highlight: AFM 34 is more than 1,000 more leak proof than TA Luft and VDI Guideline 2440 requirements call for – even after 48 hours of exposure to air at 200 °C (392 °F) in a gasket installed in a DN 40/PN 40 flanged connection!